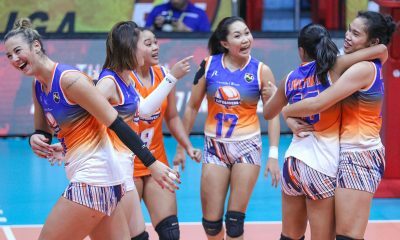 The Bureau of Customs Transformers bounced back from their stinging defeat against Pocari Sweat last week with a straight-set victory over Philippine Coast Guard Lady Dolphins, 25-18, 25-12, and 25-18 in the 13th Shakey’s V-League Reinforced Conference Monday night at the Philsports Arena in Pasig City. With the Customs’ fourth win in the conference, they are now assured of a slot in the semis. Everyone fielded inside the court except the liberos scored for Customs, but Alyssa Valdez was the lone double-digit scorer in tonight’s victory by leading the team with 14 markers off 11 attacks. Natthanicha Jaisaen made 26 excellent sets. An erroneous Set 1 defined Customs’ style of play, which helped Coast Guard to punch in points and inch within striking distance. The Transformers were owning a 20-11 lead, but a bunch of outside hits and net touches aided the Lady Dolphins to close by five, 23-18. Fortunately for BOC, Kanjana Kuthaisong and Pau Soriano pulled two straight hits to lift Customs to a 1-0 lead, 25-18. The following set became a lopsided affair in favor of the Transformers, who established a wide 16-5 lead approaching the midway mark. 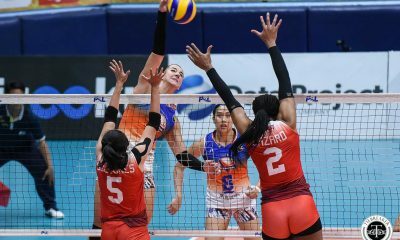 From that point on, Customs never allowed any Coast Guard surge to happen, scoring seven points more capped by a Valdez off-the-block hit to wrap the set in their favor and post a commanding 2-0 set lead, 25-12. With momentum on their side and in full swing, Customs went full blast in the final period by posting another double-digit lead at 18-8. Despite the Lady Dolphins being able to score off unforced errors and open kills by Sam Dawson, 23-15, the Transformers weathered such as Menchie Tubiera delivered the last two shots to post their fourth win of the conference, 25-18. 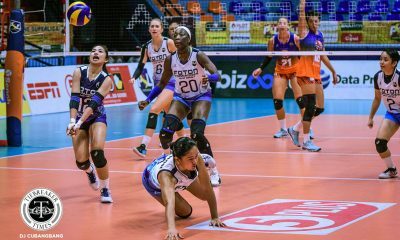 Despite earning a spot in the semis, Customs head coach Sherwin Meneses does not want to get caught up in the moments, quipping that they still have a game left before ending the prelims. “Kailangan namin ipanalo yung next game,” said Meneses post game. Dawson was the lone bright spot for the still-winless Lady Dolphins with 11 markers. 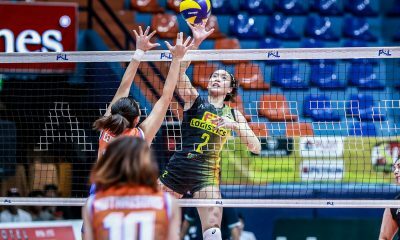 Customs (4-2) will look to end the preliminaries with another win versus Philippine Air Force Lady Jet Spikers this Saturday, October 29 at 6 PM. Coast Guard (0-6) will try to finish their conference strong against BaliPure on November 2, Wednesday, at 4 PM. Bureau of Customs (3) – Valdez 14, Kuthaisong 7, Castañeda 5, Mabbayad 5, Vargas 4, Jaisaen 4, Tubiera 3, Soriano 3, Corpuz 2, Mandapat 2, Marzan 2, Llagoso 1, Ibisa L, Emnas L.
Coast Guard (0) – Dawson 11, Mea 6, Caraan 5, Malapit 3, Necesito 2, Pesebre 1, Eniong 1, Garcia 1, Cecilio 0, Querijero 0, Fidel 0, Tabion L.